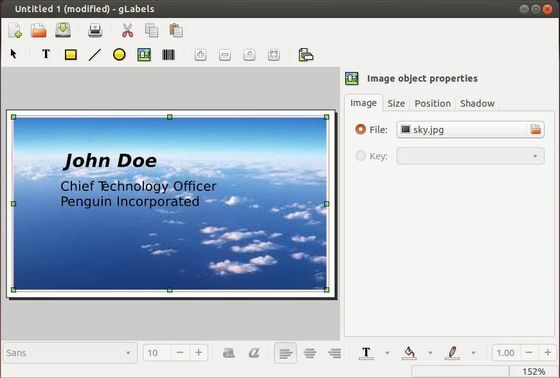 There’s a lightweight tool in Ubuntu repository called gLabels, which makes it easy to create labels, barcodes, business cards and media covers. gLabels is simple and easy to use. On its main window click on “Create a New file” button, and then you can choose to create labels, business cards, CD/DVD covers, Photo Products, or even user defined items under Category drop-box. Choose Brand and Paper size and get started designing your label or card. In next window, you can easily add text, rectangle, ellipse, pictures and edit the size, position, shadow, set as font or background, etc. Finally save or print your job and done! To install gLabels, just open up Ubuntu Software Center, search for and click install it. gLabels use the CMYK color or RGB color ?